It is necessary to have a fundamental knowledge of history, geography, political and economic theories associated with the events that are happening around us. Unless one keeps himself abreast of the historical background or the geographical location of events reported, they will convey little of the value of importance. 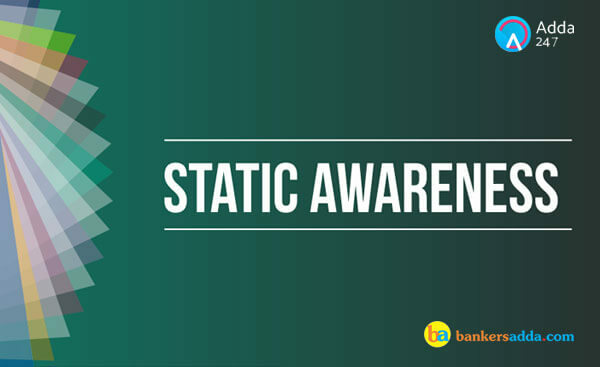 The questions on Static Awareness are related to countries, events or any such stuff that has been in news for a while. Following is the Adda247 Quiz on Static Awareness with the questions that are asked very frequently in the banking Examinations. Q1. Who is the governor of Bihar? Sol. Satya Pal Malik is the current Governor of Bihar appointed by President Ram Nath Kovind on 30 September 2017.Earlier, he was the member of the 9th Lok Sabha and represented Aligarh Constituency from 1989 to 1991. He was member of Rajya sabha from Uttar Pradesh during two term of 1980-86 and 1986-1992. Q2. Who is current Information & Broadcasting Minister in Narendra Modi government? Sol. Smriti Zubin Irani is an Indian politician, former model, television actress and producer. Irani is a Member of Parliament, being elected to the Rajya Sabha from the state of Gujarat. She is the current Information and Broadcasting and Textiles Minister in the Government of India. Q3. Capital of Antigua and Barbuda is? Sol. Antigua and Barbuda is a twin-island country in the Americas, lying between the Caribbean Sea and the Atlantic Ocean. It consists of two major inhabited islands, Antigua and Barbuda. St. John's is the capital and largest city of Antigua and Barbuda. Q4. Ranthambore National Park is situated in which of the following Indian state? Sol. Considered to be one of the best spots to view the Bengal Tiger, Ranthambore National Park is located in Rajasthan and lies between the confluence of the Banas and the Chambal River. The protected forests are also famous for their large banyan trees and is enshrines a Medieval fort. Tiger, Hyena, Sloth Bear and Chital etc. are some of the rare species found here. Q5. National Voters day is observed on which of the following date? Sol. In order to encourage more young voters to take part in the political process, Government of India has decided to celebrate January 25 every year as 'National Voters' Day'. It started from January 25, 2011 to mark Commission's foundation day. Q6. Which city is served by Raja Bhoj Airport? Sol. Raja Bhoj Airport is the primary airport serving Bhopal in the state of Madhya Pradesh, India. It is located in Gandhi Nagar area which lies 15 km north-west of Bhopal city center on National Highway 12.It is the second busiest airport in Madhya Pradesh after Devi Ahilya Bai Holkar Airport in Indore. Q7. Which city is also known as Leather City of the World? Sol. The Indian city of Kanpur, right next to the Ganga carries the nickname “Leather City of the World”, because it’s the center of India’s leather production. 5000 people in approximately 400 tanneries working at starvation wages with the highly toxic Chrome-IV, which is used for process of leather tanning. Sol. Diet, also called Imperial Diet, Japanese Kokkai (“National Assembly”), or Teikoku Gikai (“Imperial Assembly”), the national legislature of Japan. The National Diet is Japan's bicameral legislature. It is composed of a lower house called the House of Representatives, and an upper house, called the House of Councillors. Both houses of the Diet are directly elected under parallel voting systems. Q9. Kadana dam is in which of the following state? Sol. Kadana Dam is an earthen and masonry dam on the Mahi River in Mahisagar district of Gujarat, India. The dam was constructed between 1979 and 1989. The dam supports a pumped-storage hydroelectric power-station. Q10. Kaiga Nuclear Power Plant is in which of the following Indian state ? Sol. Kaiga Generating Station is a nuclear power generating station situated at Kaiga, near the river Kali, in Uttar Kannada district of Karnataka, India. The plant has been in operation since March 2000 and is operated by the Nuclear Power Corporation of India. Q11.What is the Currency of Algeria? Sol. Algeria is a North African country with a Mediterranean coastline and a Saharan desert interior. The dinar is the currency of Algeria and it is subdivided into 100 santeem . Q12. Kaziranga National Park is situated in which of the following Indian state? Sol. Known for the largest population of the Indian one-horned Rhinoceros and Tigers in the world, the Kaziranga National Park is located in Assam. The forests are spread across an area of 430 Square kilometers and are home to species like Tigers, Rhinoceros, Elephant, and the Asian water buffalo, Swamp Deer, Monitor Lizard and Spectacled Cobra etc. Q13. Rouff is the folk dance of which of the following state? Sol. Rouff is also a folk dance of Kashmir. It is danced solely by women on festive occasions. Rouff displays simple footwork. This good looking ballet shape elegances at all the celebratory events and particularly at Ramzan and Id days. Moreover it is executed by the collection of girls that faces each other when dancing. Q14. Ukai Dam is in which of the following state? Sol. The Ukai Dam, constructed across the Tapti River, is the largest reservoir in Gujarat. It is also known as Vallabh Sagar. Constructed in 1972, the dam is meant for irrigation, power generation and flood control. Q15. Jawaharlal Nehru Stadium is in which of the following city? Sol. Jawaharlal Nehru Stadium is the multipurpose sports stadium and one of the most important sports Stadium of Delhi. The Jawaharlal Nehru Stadium of Delhi was the main stadium used for the major sporting events of XIX Commonwealth Games in 2010. It is the third largest multipurpose stadium in India in terms of seating capacity of 60,000 and extended up to 100,000 for concerts. The Stadium is owned by Indian Olympic Association.